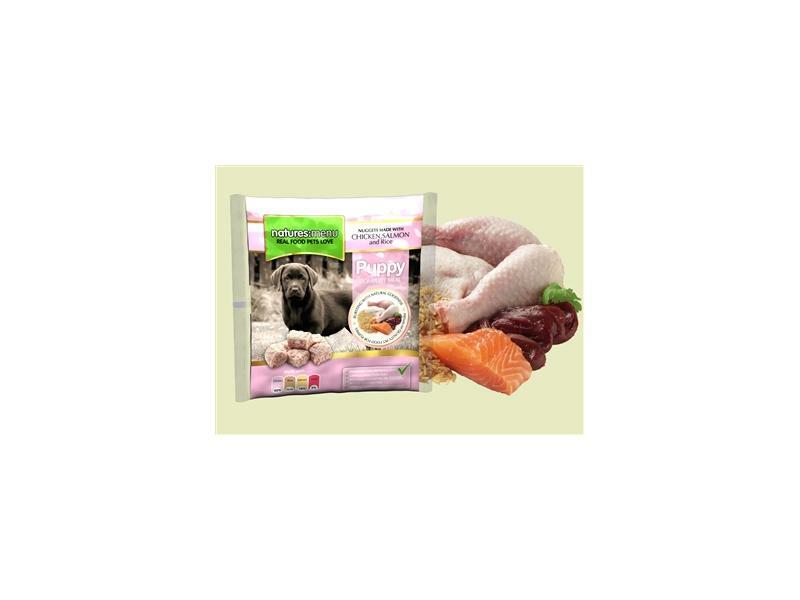 Natures Menu range of complete dinners are frozen easy to serve pieces of fresh meat, vegetables & parboiled rice. They are a complete and balanced dog food and will provide your dog with all the nutrients, vitamins and minerals they require for a healthy full life. Our Complete Raw Puppy Food provides a safe, simple and convenient way to feed a Raw diet to your pup and easily ensure they are getting all the nutrients they require for healthy growth and balanced energy every day. Chicken is an excellent source of highly digestible, lean protein, and essential amino acids. Ground Bone contains natural glucosamine and chondroitin and essential fatty acids, omega 3 and 6. It also contains calcium and phosphorus in naturally correct ratios. Par Boiled Rice is a great non starchy carbohydrate which will give your puppy an easy to digest source of b vitamins and minerals. Green tea and Grape Seed extracts gives the pet added antioxidants to help minimise the damage free radicals can cause and promote health. Yucca is great for aiding digestion. Vitamin A 1,500iu, Vitamin D 150iu, Vitamin E 21mg. Trace elements: Zinc oxide 39mg, Iron sulphate monohydrate 30mg, Copper sulphate pentahydrate 11mg, Calcium iodate anhydrous 0.65mg, Selenium yeast inactivated 13.2mg/kg. There are currently no questions for Natures Menu Puppy Frozen Bite Size Nuggets - be the first to ask one!